Senior living industry association Argentum has launched a multi-year initiative aimed at helping providers improve the quality of care they offer in their communities. The new initiative, dubbed “Senior Living IQ,” includes an informational website where senior living workers can glean industry-wide best practices and procedures. The initiative was officially unveiled Wednesday at the 2018 Argentum Senior Living Executive Conference in San Diego, California. The first phase of the effort focuses on creating awareness about resident safety issues. As the scope of the new initiative expands, Senior Living IQ will address other high-risk areas, such as emergency preparedness, serving memory-impaired residents and medication management. Eventually, the goal is to help foster skills development and create certifications for senior living workers. 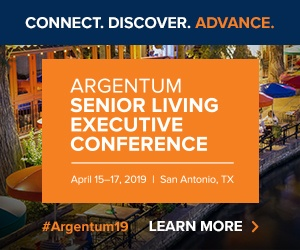 Senior Living IQ isn’t the only new initiative Argentum introduced during its conference this week. On Tuesday, the association unveiled a new senior housing workforce initiative called ”Senior Living Works,” which includes a website with workforce engagement toolkit, relevant news and articles, and career-focused videos.